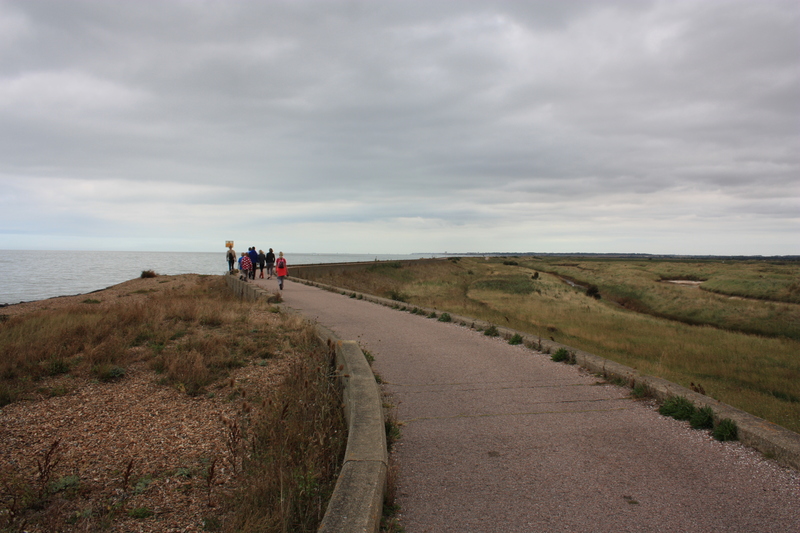 Having seen what we wanted to see at Herne Bay, we continued our walk, through Reculver and on to Birchington, just to the west of Margate. 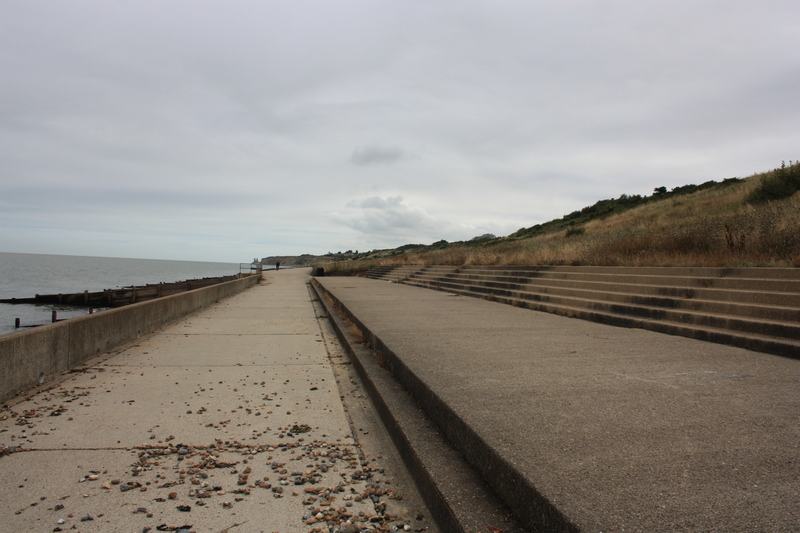 The coastal path out of Herne Bay is a flat concrete slab which we found slightly uninteresting. 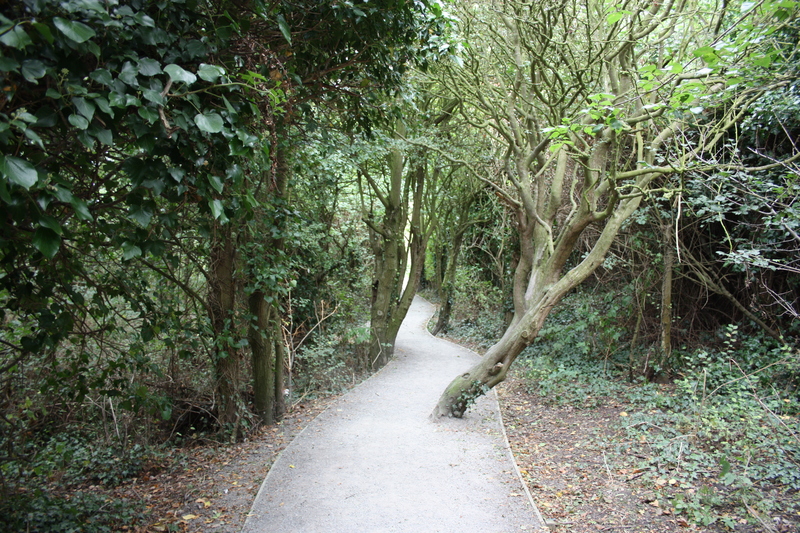 Soon enough the path diverted inland, up towards Reculver Country Park and a cliff-top walk. The concrete path did in fact continue underneath the cliffs, but led to a dead end. We soon found out why. The signs warning people not to venture that way were both numerous and dramatic (particularly if you were a stick man). The route through Reculver Country Park was a short but welcome break after the monotonous concrete. I liked the fact that whoever constructed the man-made path decided, at one point, to allow a tree to stay where it had rooted, right in the middle of the path, rather than cutting it down to make way for man’s modern convenience. The path quickly emerged at the cliff-top. 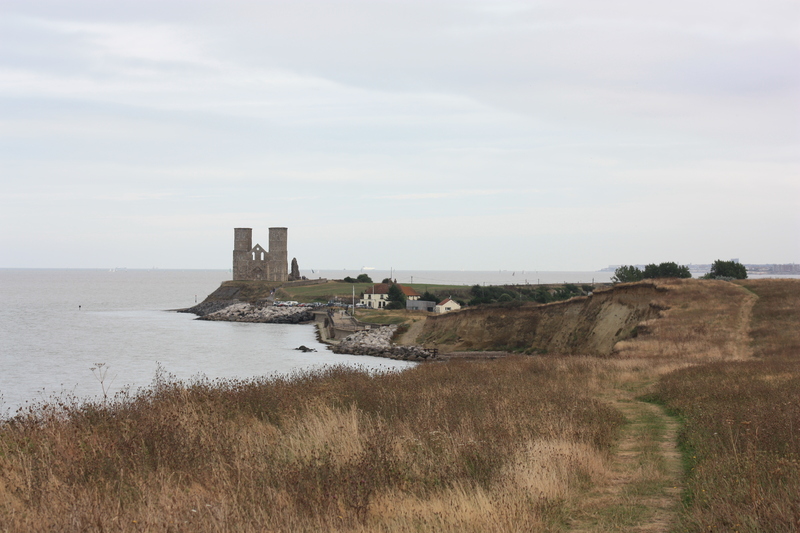 As we rounded the corner, the twin towers of Reculver came into view. We walked down, being overtaken by mountain bikers who came hurtling by at breakneck speed. Reculver itself was quite busy today. 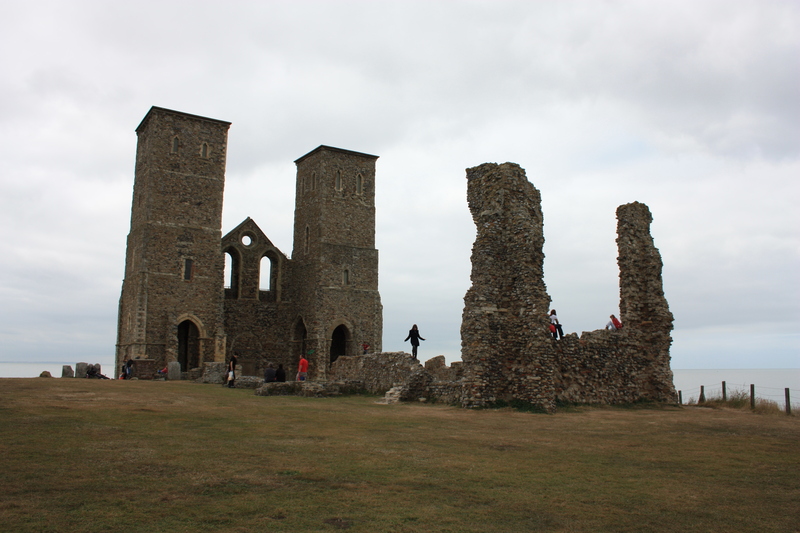 After lunch we climbed the short path to St Mary’s, the towers of which are Reculver’s famous landmark. Originally a Saxon monastery dating back to the 7th Century, the towers themselves were added in the 12th Century. The church was used right up to 1805 when coastal erosion forced the parishoners to evacuate. The church was demolished, but the towers were left as a navigational aid. They remain both prominent and impressive today. The rest of the church is largely gone, although a section of wall remains in place at the opposite end. Whilst we were there a woman sat on this wall the whole time, chatting on her mobile, oblivious to the fact that others wouldn’t particularly want her in their pictures. Never mind – all sorts of people were doing all sorts of clambering. Maybe the top of the wall was the only place she could get a signal. 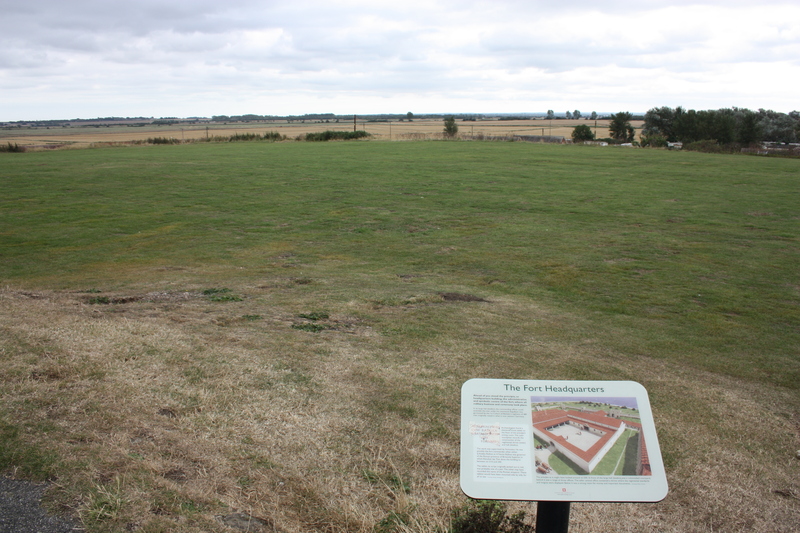 Next to the church is the site of a Roman fort, Regulbium. To our untrained eyes, there was rather less of the fort to observe than the church. The path out of Reculver and into Birchington is known as the Northern Wall. 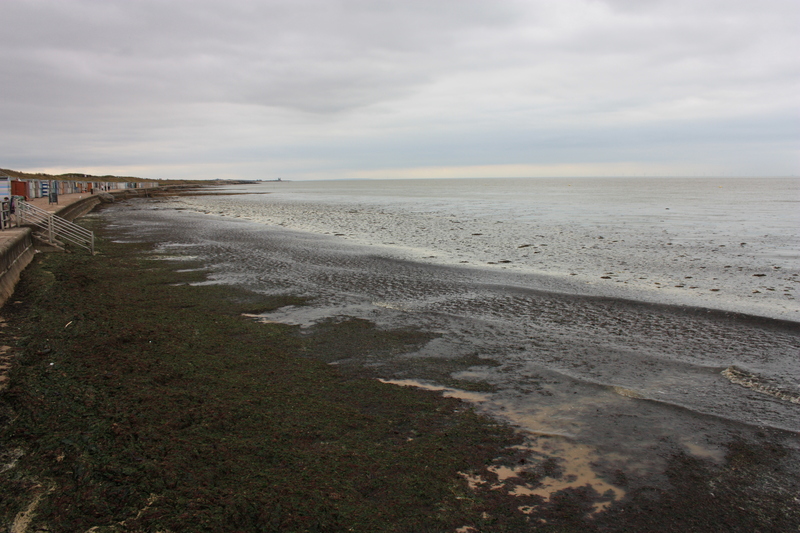 Just outside of Reculver we saw a large shellfish hatchery, full of manmade shellfish beds filled with water. This was another flat path, but unlike the concrete slab outside of Herne Bay this one was more interesting. Winding its way around the coast, it made for good walking. We picked up our pace quite significantly. 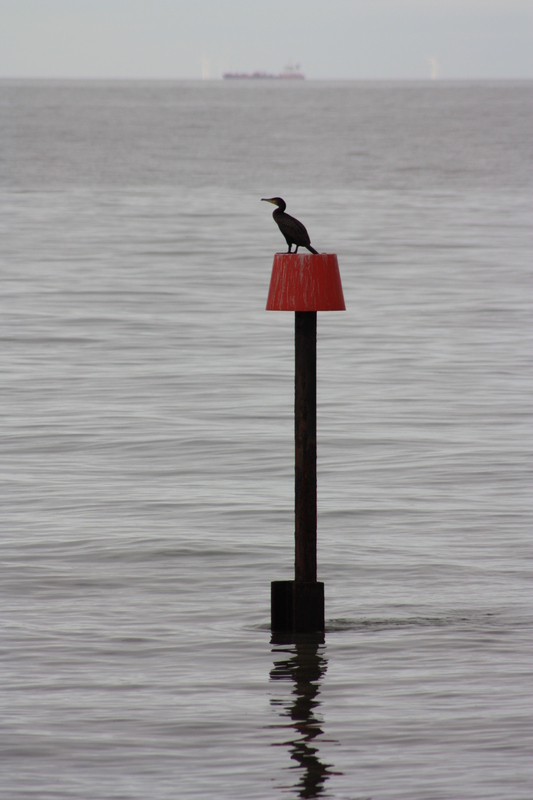 We saw a lone cormorant, perched on a post close to the shore. As we watched, it spread its wings. 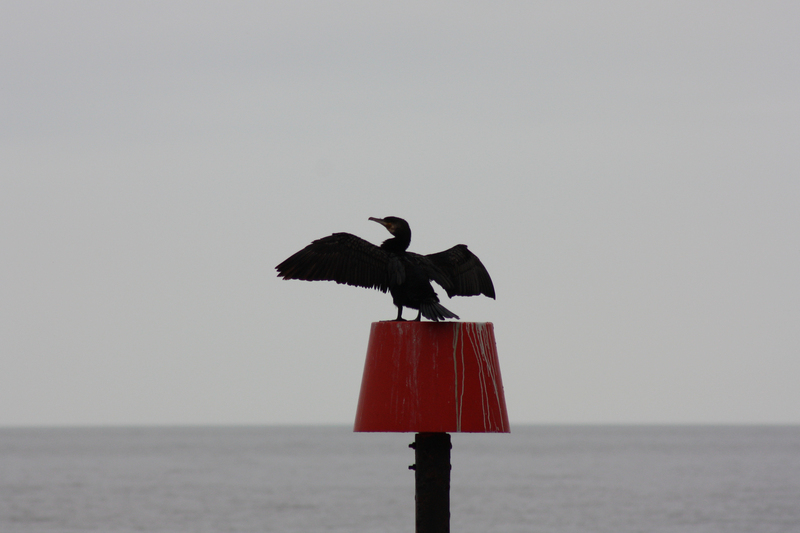 I didn’t realise until later that this is the typical perch position of cormorants. It stayed in this position and didn’t move. 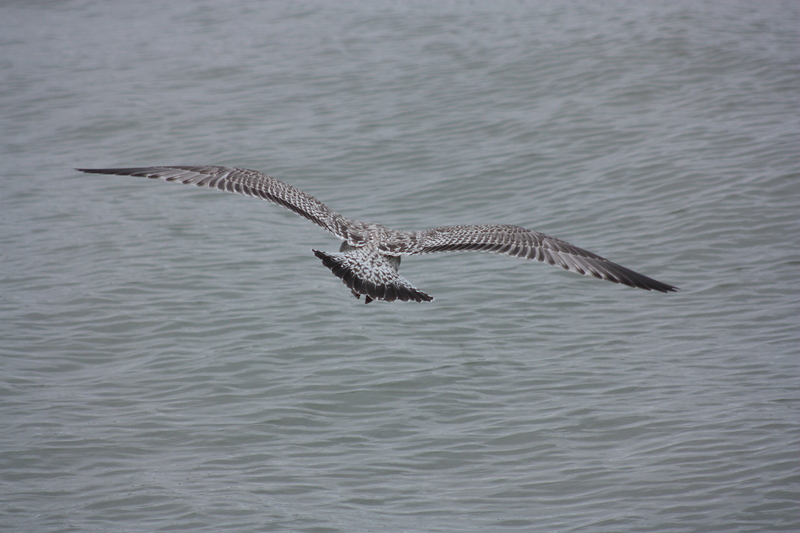 Eventually we left it there, still with its wings half outstretched, staring out to sea. On the outskirts of Birchington is Minnis Bay. We wandered along the sea front. The water looked somewhat uninviting! We reached our end destination and called a taxi. As we waited the local gulls allowed us to get quite close before flying off. 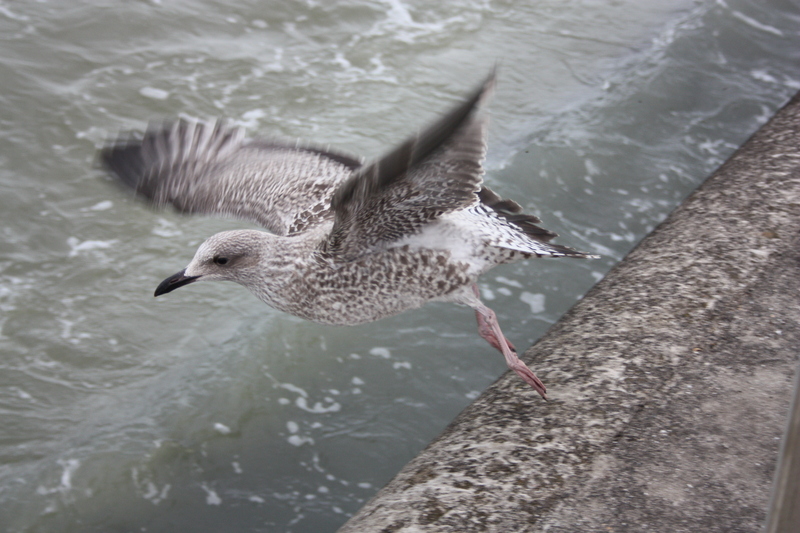 This entry was posted in Kent and tagged coast, Kent, reculver, Regulbium, seagull, travel, walking. Bookmark the permalink. Thank you – I didn’t know that. You are making great progress. Like you, I found the walk from Herne Bay to Birchington slightly boring (enlivened by the lovely Reculver towers and a lunch at the nearby pub). After Margate, you come to a lovely section of coast…… Something to look forward to. And we get to turn the corner and start heading south instead of east – we’re looking forward to it. We went through Margate this weekend and had a great time. But the section you are on looks even better still! Keith is right about the Cormorants – we have them here, too… I think I read somewhere that they don’t have the oils on their feathers that other birds do – it helps them dive deeper for fish. The downside is that they take a while to dry out. 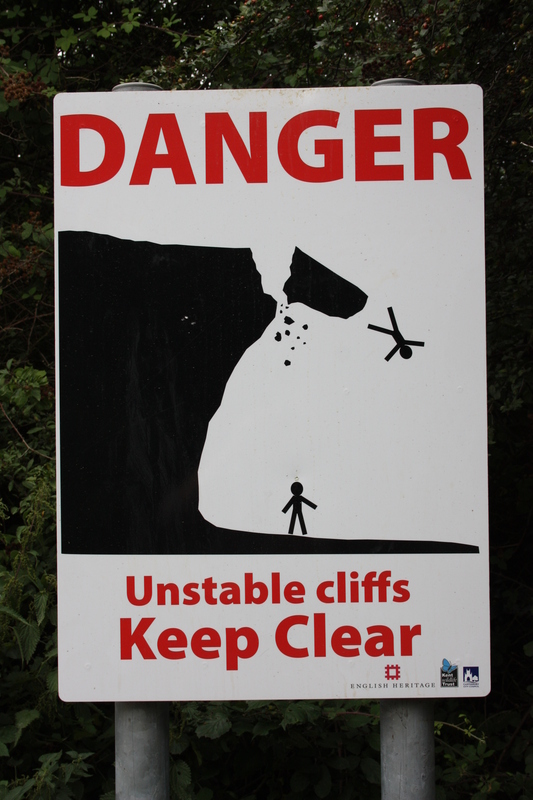 I *love* stick-people signs… they never fail to entertain! We live in Birchington and know the route inside out, spent a few nights along there this summer to get away from some soccer games. It’s a bit of a walk from Birchington to Reculver but can do it on a bike inside 30 minutes with right conditions. Check out the tavern at the trailer park, The Ethelbert Inn. Prices are expensive and when we went back in June we didn’t get home until 5am. A much better, and safer walk, can be had from Herne Bay (hampton Inn) to Whitstable harbor. It’s about four miles and is much easier and better than the other route, but there is still another nuisance trailer park, but has been shut down for season now I think. 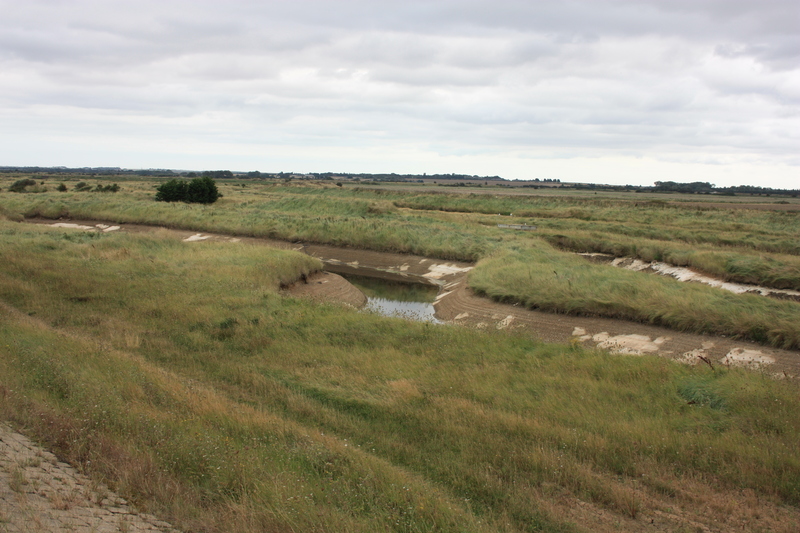 Also, turn off before Minnis Bay and along to Plumpudding Island and horse stables, and there’s a route across country that goes to Saint Nicholas, but public transport is not the best for getting back.